I’m not vegetarian, but I do enjoy vegetarian food. Every Monday, I experiment with a recipe that typically contains meat and try to make it with lentils, beans or another legume. I support ‘Meat Free Mondays’ for a couple of reasons; I like the taste of legumes and pulses, they’re lower in saturated fats than red meat PLUS I like the challenge of trying to make something where my boyfriend doesn’t notice the meat is ‘missing’! If you’re thinking about becoming vegetarian or vegan though, it’s more complicated than just cutting meat and animal products from your diet. First things first, a lot will depend to what degree you cut out meat. Is it just red meat (demi-vegetarian)? No red meat or poultry but you’ll eat fish (piscatarian)? No animals but still eat eggs and dairy (lacto-ovo-vegetarian)? Or no animals or animal products at all (vegan)? All of these animal products contain nutrients that your body needs, so naturally, if you’re cutting them out then you need to find an alternative source. Proteins are made up of tiny pieces called amino acids. Amino acids are required by the body to make hormones, enzymes and replace muscle tissue. Some amino acids are essential; the body cannot make them, so they need to be ingested through our diet. Most meats and animal products are called complete proteins, which means that they provide all of the 9 essential amino acids. If still consuming dairy products and eggs, these are valuable sources of protein too – with eggs being a complete protein. Quinoa and soya beans are also technically complete proteins, although they do not contain as higher levels of these amino acids as animal products do. Therefore, it’s best to mix things up a bit! Quinoa, despite it being a complete protein, is not a rich source, so it should not be the only protein containing food vegetarians eat. Your diet should also contain rich sources, ie; eggs, chic peas, beans and lentils. However, most vegan sources of protein are not complete, meaning that in order to obtain all of the essential amino acids, a couple of protein sources need to be mixed. Legumes (lentils, chic peas, beans etc) are typically low in the essential amino acid called methionine. Grains (rice, cous-cous, brown bread etc), while containing methionine, are insufficient in lysine. By combining legume + grain, vegetarians or vegans can obtain a complete protein. For example; beans on toast, rice and black bean curry, lentil soup and bread or pita bread and hummus. Meat eaters and vegetarians should aim to have 2-3 servings of complete proteins per day. Another nutrient to be aware of is iron. Women have a higher requirement of iron than men (due to menstruation) and intakes are typically below what is recommended, especially in adolescent girls. Iron found in meat is called haem-iron, and is more readily absorbed than non-haem iron. For this reason, female vegetarians especially, need to ensure that they’re having a couple of sources of non-haem iron daily. 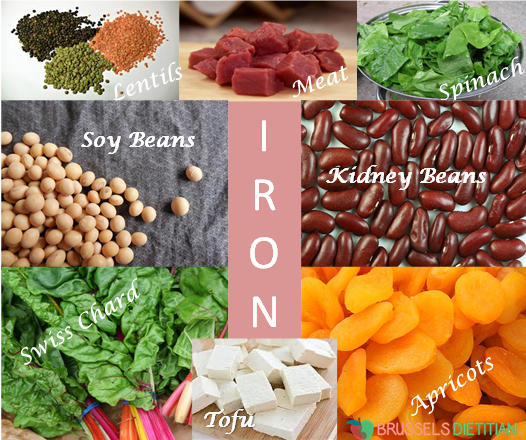 Iron can be found in beans and pulses, eggs, fortified breakfast cereals, dark green leafy vegetables (like spinach, broccoli and swiss chard), wholemeal flour, dried apricots and seeds. As I said, these non-haem sources of iron aren’t so easily absorbed by the body, however, there are a few tips than can help enhance absorption. Vitamin C (found in citrus fruits, peppers and sweet potato) helps improve the amount of iron we can obtain from food. So having a glass of orange juice with cereal or some sweet potato in your lentil soup will help up your iron intake. Also, avoid having tea and coffee alongside a meal as they contain tannins and phytates that bind with iron and make it more difficult for the body to absorb. If vegan, good sources of calcium will be required to replace calcium obtained from dairy (see my nutrient nugget for more info on calcium). Calcium is found in green leafy veg like; kale, broccoli, rocket and watercress, beans, pulses, fish where you eat the bones (tinned mackerel/sardines), almonds, brazil nuts, sesame seeds and dried apricots. Some soya milks and tofu are also fortified with calcium. Vitamin D (obtained from sunlight) enhances calcium absorption, so those at risk of poor vitamin D status should eat a variety of the above foods daily and certain populations may need to consider a vitamin D supplement. Vitamin B12 is found in animals and animal products. The requirement for this nutrient is small so deficiency is rare but strict vegans should consume a fortified food. For example; yeast extract (marmite), fortified soya products, breakfast cereals and vegetable stocks. Finally, as milk is an important source of iodine, vegans are at risk of low intakes. If this is the case it’s recommended to use iodized salt or take a nutritional supplement. In order to get all the vitamins and minerals we need, a large variety of fruits and vegetables should be eaten. Think about eating as many different colours as possible! This, alongside beans, lentils, grains and nuts will help ensure your vegetarian or vegan diet is adequate in all nutrients. Reblogged this on GRAPE AND GANDER.